The central conceit of an entire civilization evolving within the confines of a spaceport is an intriguing spin on a familiar premise, and every aspect of these peoples’ live relates to the only world they know. Thus, the societal divisions into business and economy class, the baby deliveries in Arrivals, and even the children coming of age by ‘declaring’ are all interwoven into the script effortlessly while fleshing out the culture effectively. Unfortunately, though, the cultural aspect of the story does little to actually impact events and doesn’t even lead to any sort of detailed social commentary about the situation. So while it’s intriguing to experience this interesting culture, there’s also no necessity to the culture being such an overt focal point. With Ronald Pickup doing astounding work as Elder Bones who created and protected this society for reasons and with motives not wholly explained, ‘Spaceport Fear’ very much keeps its focus to this one locale without proving that it needs to be specifically in this locale. That said, the monstrous Wailers- though not a novel concept either- are employed brilliantly within the claustrophobic environment and add a tremendous amount of tension and action to the tale. The pacing of the story also moves along briskly, and the attempts of the Doctor and Mel to escape as well as the revelations regarding characters occur at appropriate intervals to always keep intrigue and interest high. The concept of the Doctor getting around the communications systems failure by playing a game to leave messages in the scoreboard lists is also quite ingenious. In fact, the only element that doesn’t quite work is the casting of Beth Chalmers as both Beauty and Galpan, not because of the quality of her acting which is superb, but because the similarities in voice for the two characters from different rungs of society implies that there will be some hidden connection between the two that never manifests. On the production side, the direction and sound design are remarkable and truly do give the impression of being on a desolate spaceport. Although ‘Spaceport Fear’ is certainly not the most complex or daring story to come out of Big Finish, it is nonetheless refreshing to hear a story that so firmly grasps the basic fundamentals of Doctor Who. Even with the production seemingly determined to place undue importance on its setting that it never quite successfully explains as necessary, the mystery at the core of the tale forms an exceptionally intriguing foundation that highlights both Colin Baker and Bonnie Langford and certainly instills moments of fear as its title implies. 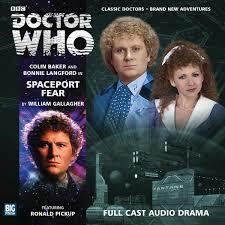 ‘Spaceport Fear’ may not be a classic, but it’s another worthwhile addition to the woefully unexplored era of the Sixth Doctor and Mel that proves that there’s still plenty of life left in this combination.